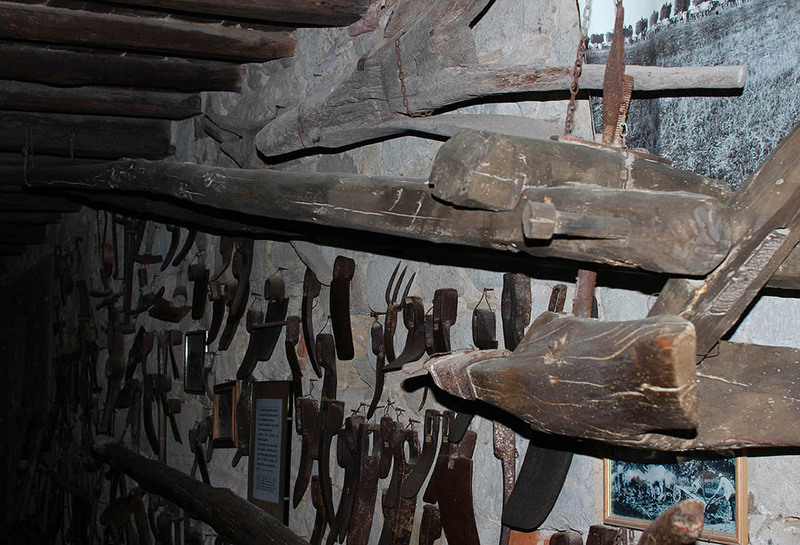 The House of the rural culture consists of 14 rooms. 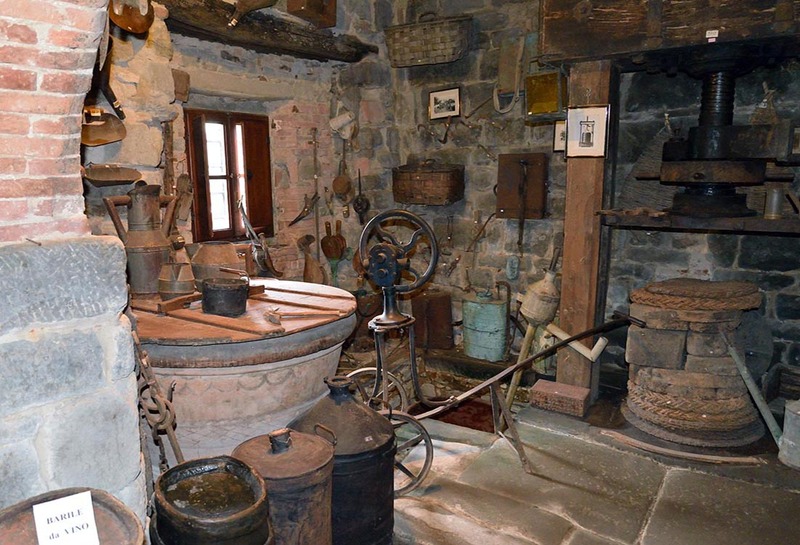 These rooms belonged to the vicarage and until few decades ago oil and wine for the farmers were prepared here. 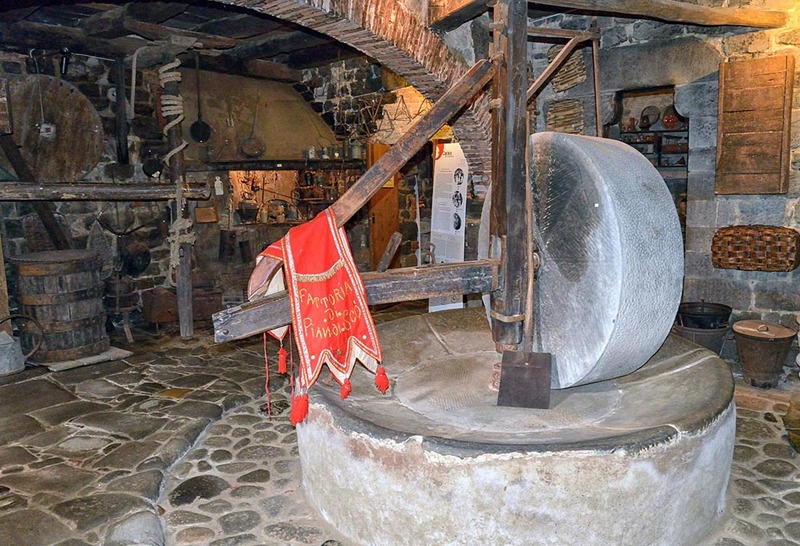 The olive press and its majestic mill stone are proof of that. 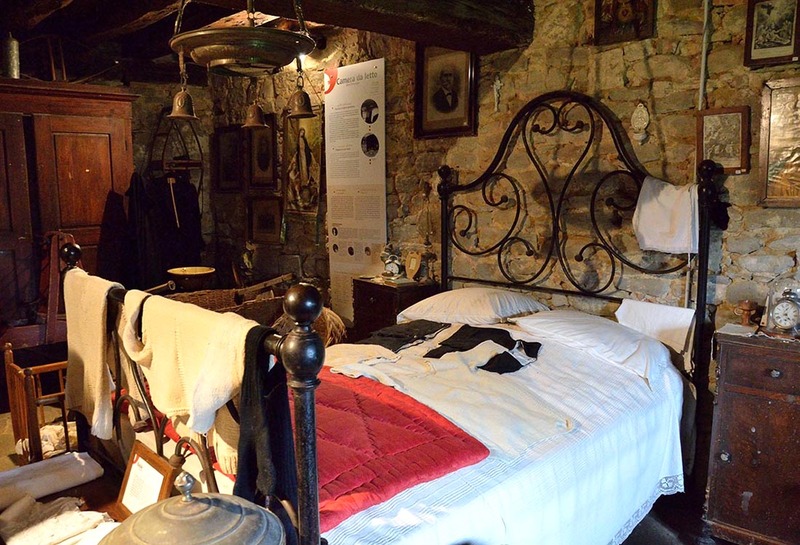 All the rooms hold the rural life memories and you can virtually visit them thanks to the illustrations on our website. In rural culture, religion and its traditions marked every situation in life: the farmer calls on God to protect them from disease and abuse, asks for the countryside and the harvests to be blessed, as a protection against famine and bad weather, to obtain high yields. For this reason the parish priest was held in high regard by the peasants, who listened to him and respected him. For the feast of Sant’Antonio abate (St. Anthony Abbot), patron saint of animals, he blessed the animals brought by the farmers to the churchyard. 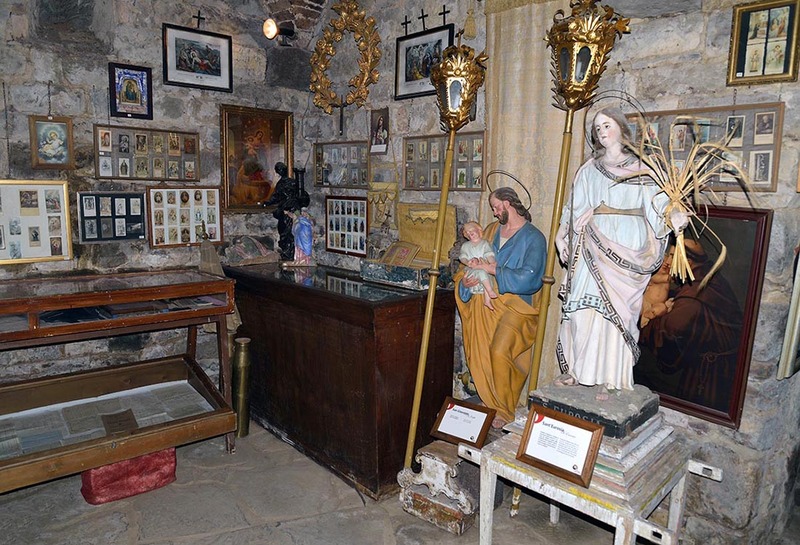 On Candlemas Day, the housewives who went to the Parish received a candle blessed by parish priest, then placed it in the bedroom at the head of the bed as a symbol and reminder of the event. 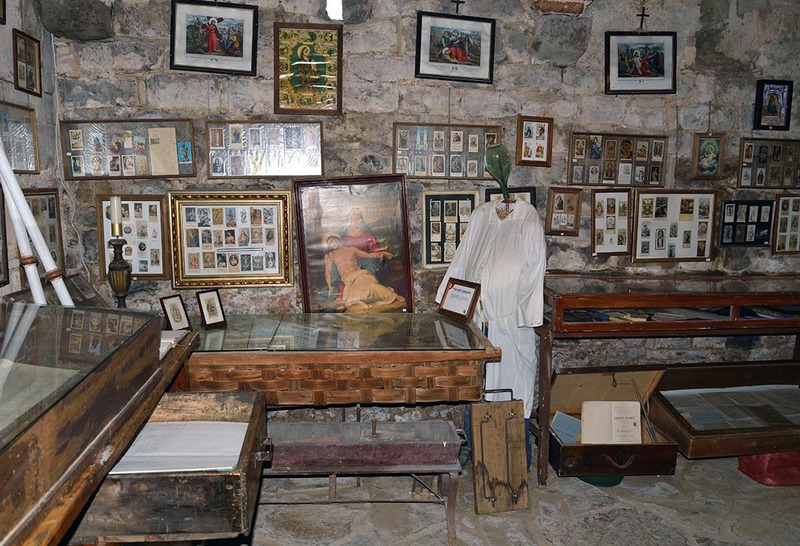 While in the days of the Ascension, the land owners were asked to decorate shrines placed along the path of the procession with flowers, candles and rose petals. The seasons were thus marked by religious events in which the whole farming community participated. 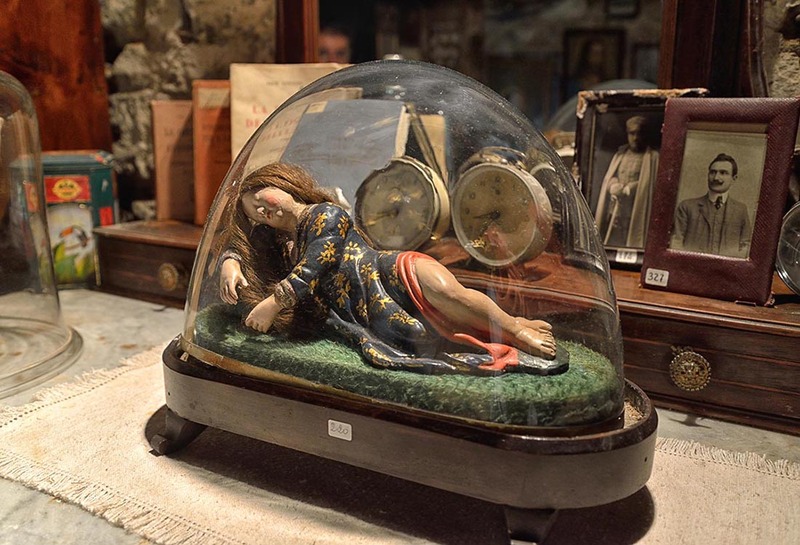 In the winter months, unmissable events were the feast of the Immaculate, the feast of San Giuseppe (St. Joseph) and Olive Sunday, when everyone adorned their homes with olive branches blessed during the service. 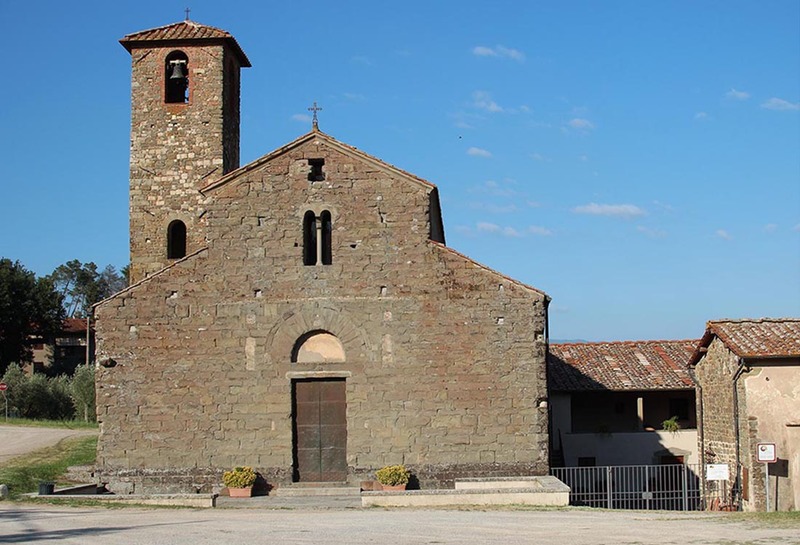 In May and October every night people went from the fields to the Parish church for the Mass and to say the rosary together with the parish priest, while the processions of Corpus Domini were true celebrations of the people. 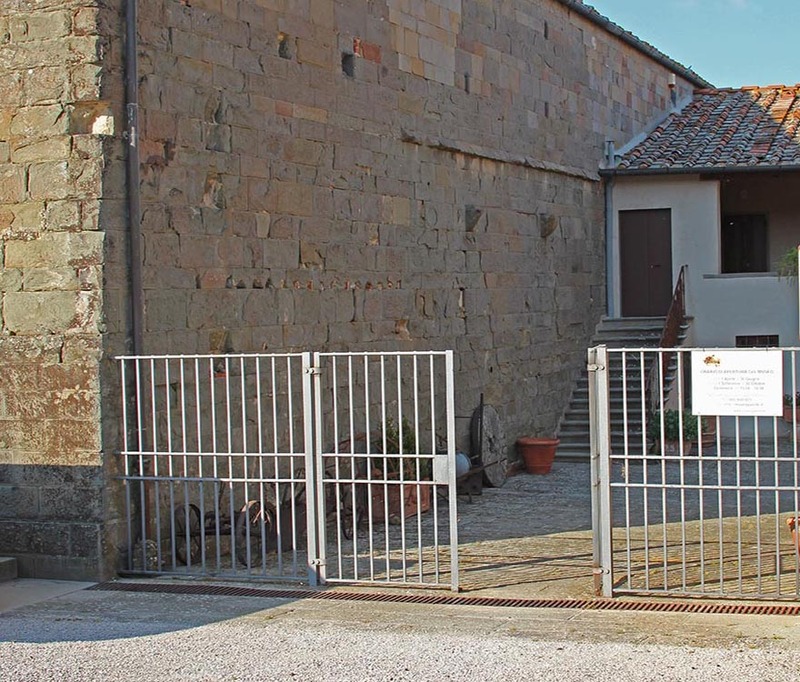 To enter the museum we have to cross a nice courtyard delimited by the parish church’s perimeter wall on one side and by a typical Tuscan arcade on the other two sides. This evocative backdrop is the beginning of an interesting itinerary. 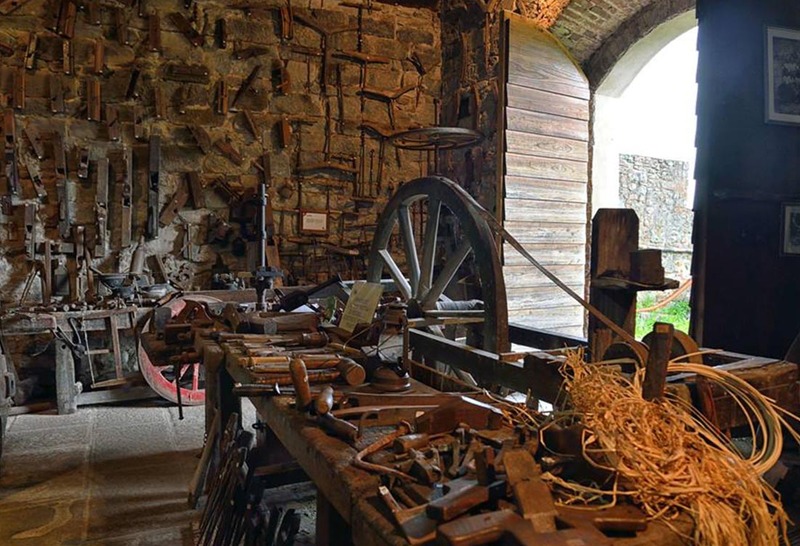 Big wooden wheels with iron tread are proof of the skill of the blacksmiths. 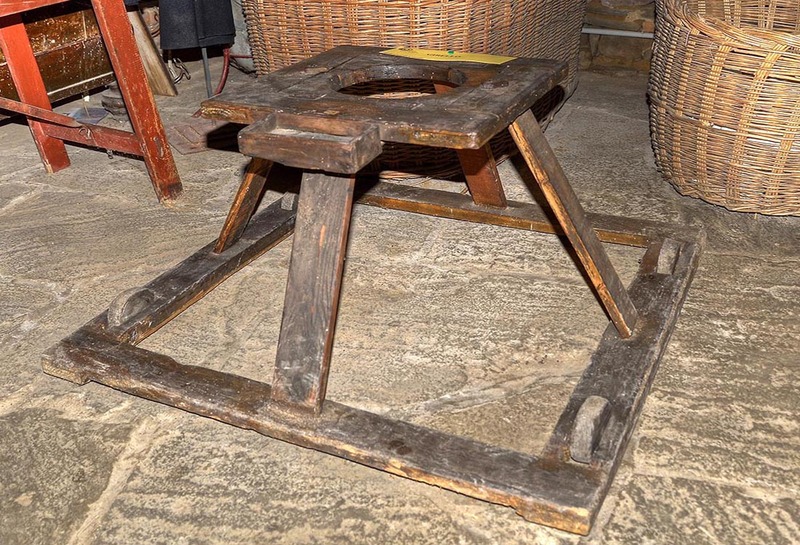 The millstone, the drinking trough and the well throw us into another world, another era when seasons marked the time passing by and every tool was suited to rural families needs. The courtyard as well as the farmyard represented an opportunity for interaction. 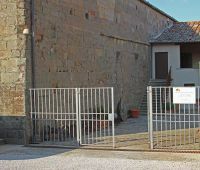 The farmers working in the fields owned by the vicarage met in the courtyard during the reaping time, the grape harvest or when they picked up olives. Here the farmers drew the conclusion of the year’s work and shared out the harvest. 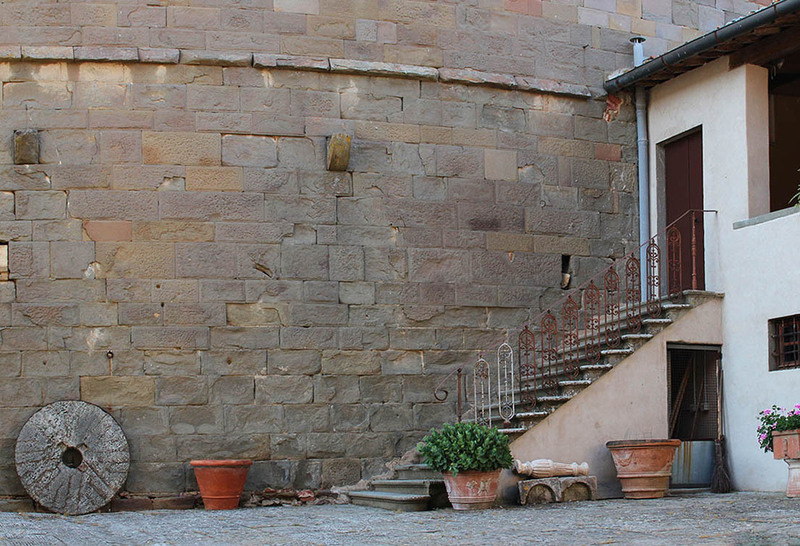 In our case the courtyard had another fundamental function : the rainwater cistern under the courtyard floor was an important reserve for people and livestock. These are just the bases that will lead us to discover the traditions of the rural life. 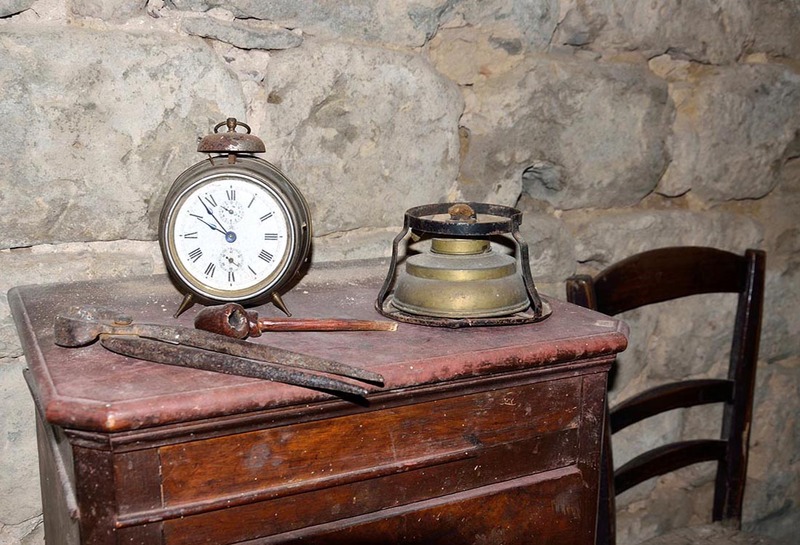 This history is handed down to us by some objects of daily life that teach us how difficult rural life was. 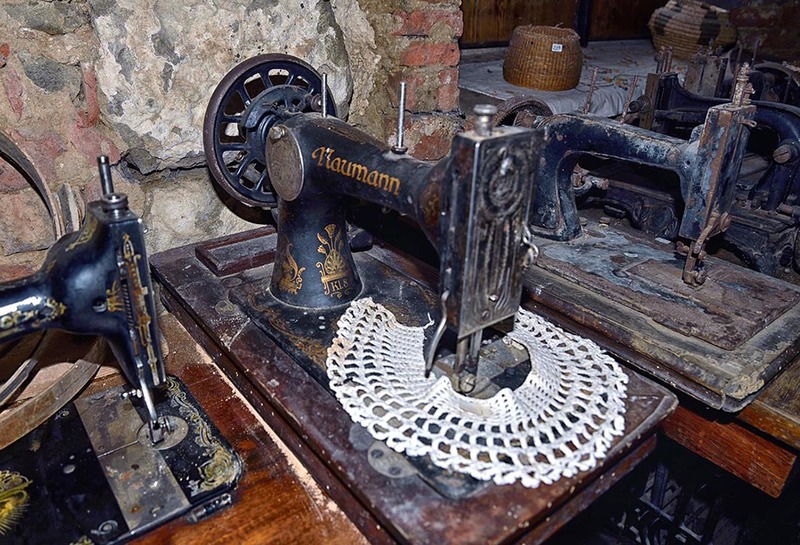 In rural households the shortage of money meant that household chores also included making one’s own clothes and textiles. 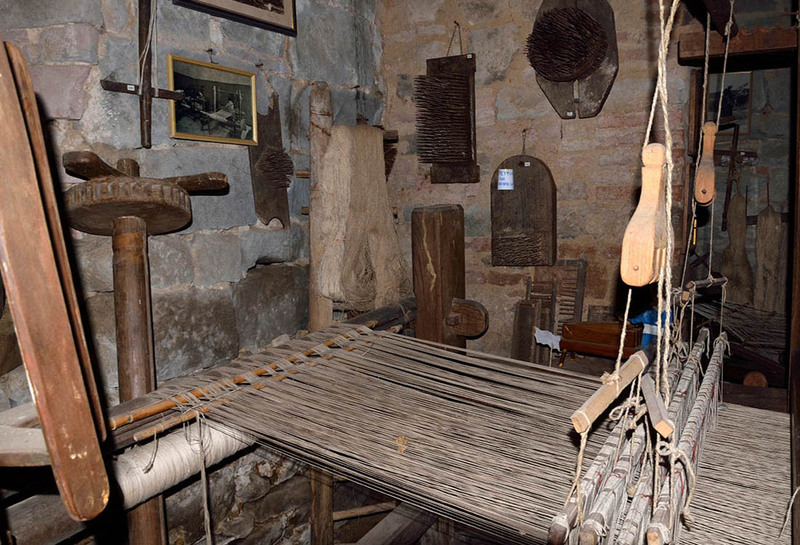 Socks and sweaters were knitted with knitting needles; sheets, pillowcases and tablecloths were woven on the loom; for special occasions, such as preparing the trousseau for a bride, the fabrics were embellished with embroidery and lace crocheted in cotton with the ancient crochet hook. 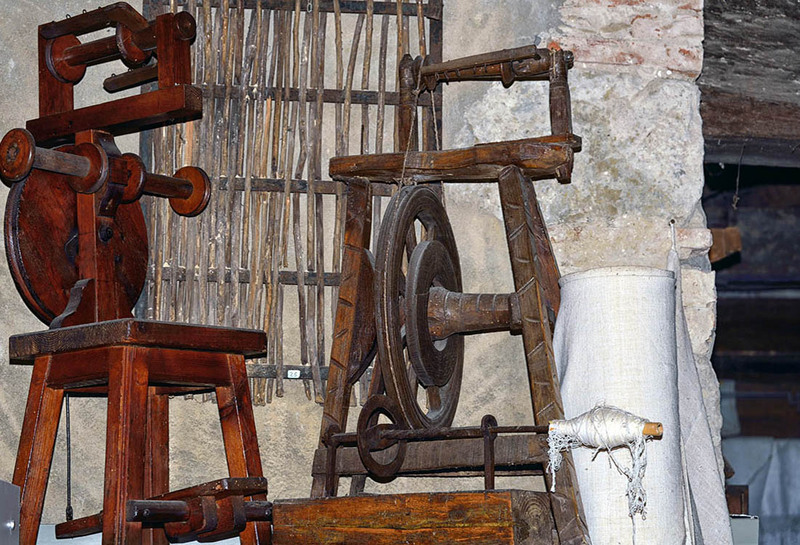 The raw material used was hemp, but there were also fabrics made with flax, such as linen. Both of these raw materials were grown on the many farms in the area. Hemp, which was planted on the edges of the fields, was harvested and left to soak in water before being dried in the sun, or better, put in the oven to dry. 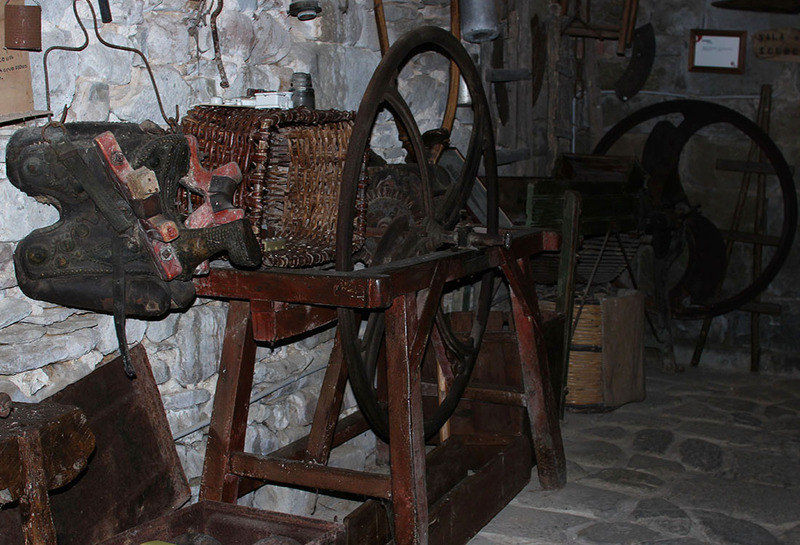 The woody part was then removed with a brake and what was left, the tow, was wound onto a distaff, spun with the help of spindles and stored in skeins. 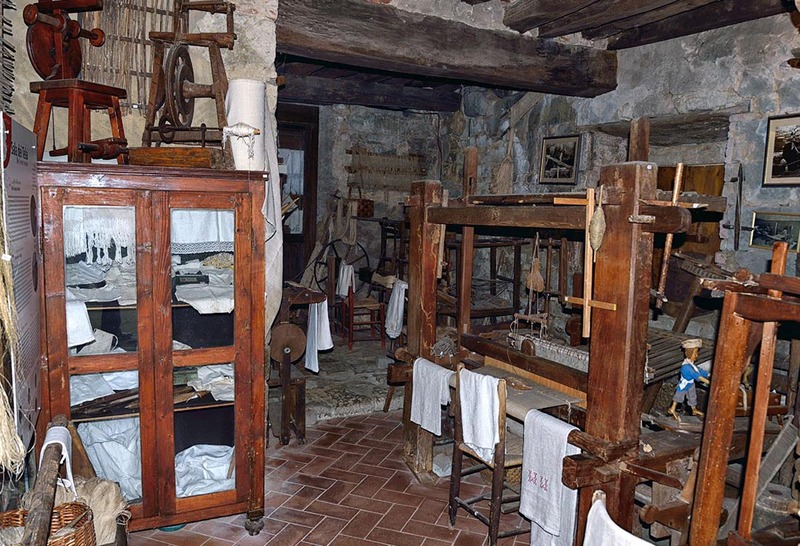 This thread was then woven by the women of the household: first they prepared the warp, the most laborious step, then the weft, which was sometimes made of cotton. 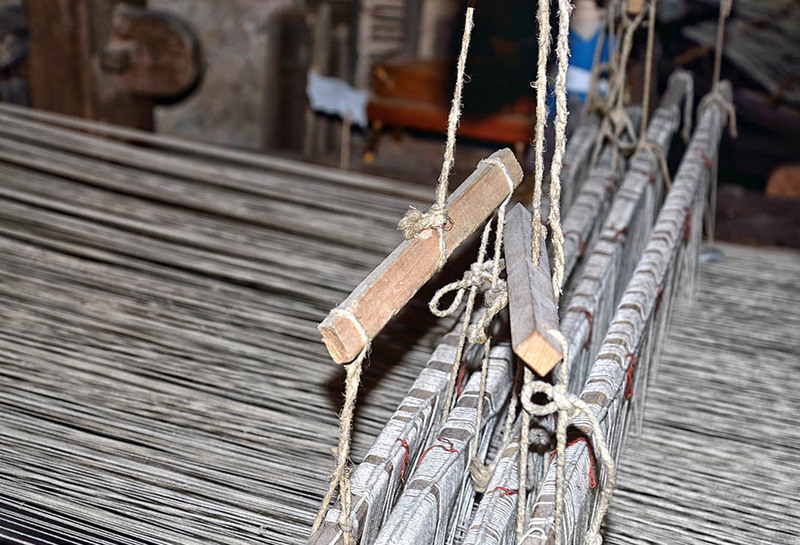 The woven cloth was then blanched in boiling water and ashes and then finished with hems and lacings. 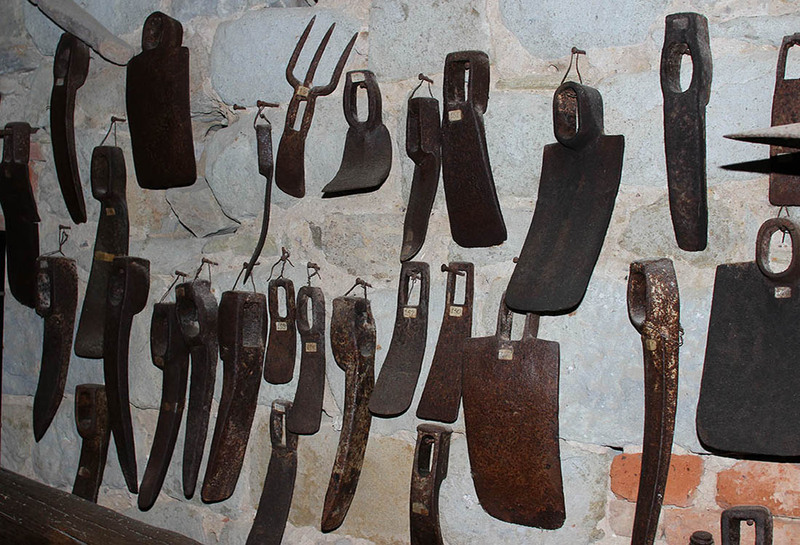 the weeder or spud and all the tools used for cultivation. 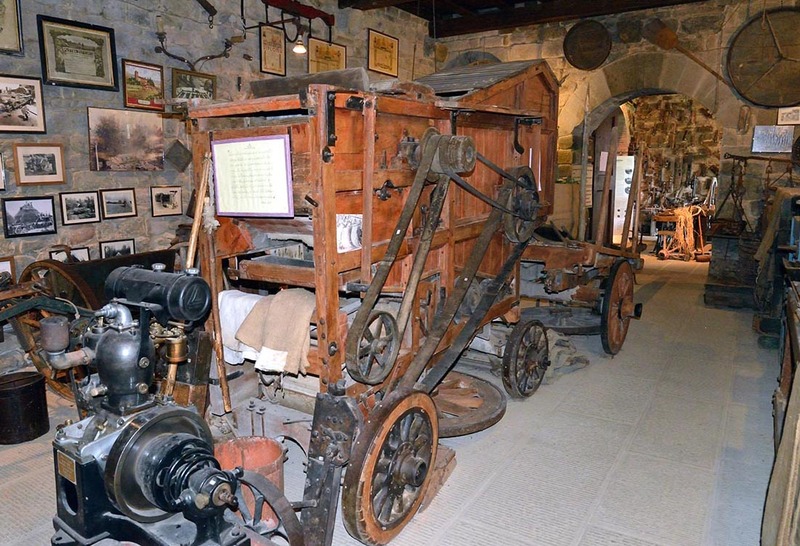 But oxen were also used for pulling carts and for transport from the field to the threshing area, from the homestead to the farm or to the market. On holidays, when people went to town and to the fairs, the animals were adorned with bows, ribbons and mirrors; the oxen’s horns were anointed with oil sludge to make them brighter and were cut or filed down to make them more pointed. 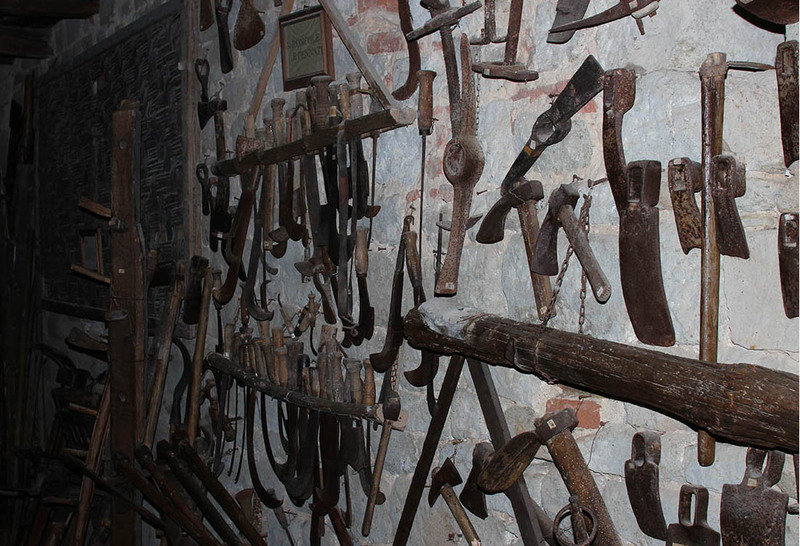 The wagon, the plough, the coulter or any other equipment were pulled by oxen with the yoke, which, due to its usefulness, was considered almost sacred by the peasant culture. 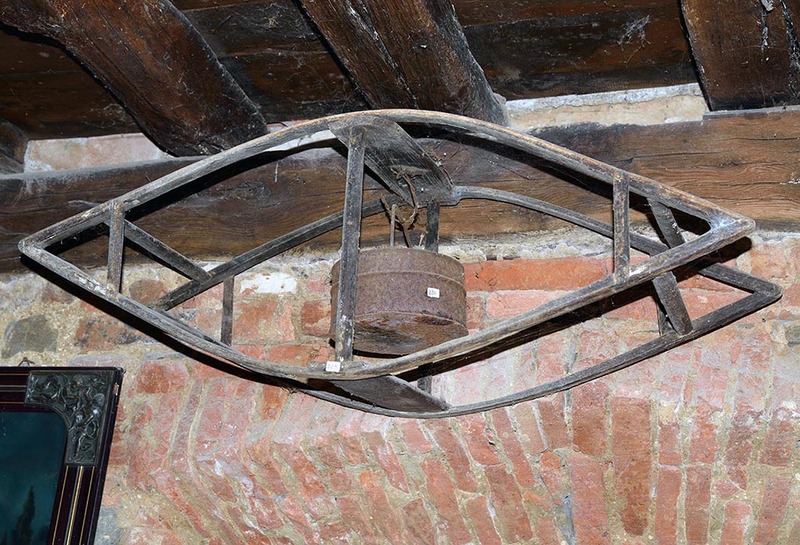 Demological studies from the 1940s showed that there was a wide-spread belief in Italy that whoever had offended or harmed the relationship with the sacred yoke by, for example, setting it on fire, was sentenced to a slow and agonizing death. To avoid this, the accused would have to ask friends and relatives to hold an amnesty, keeping a new yoke or any part of it at his bedside. 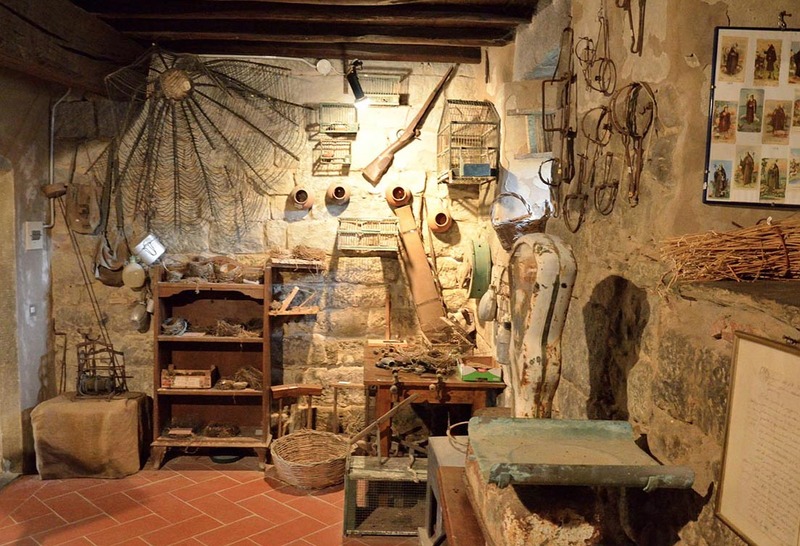 In Tuscany, olive cultivation has very ancient origins, but the production underwent a significant boost, especially from the eighteenth century onward, when the lands on the hills were terraced and allocated to this specific crop. 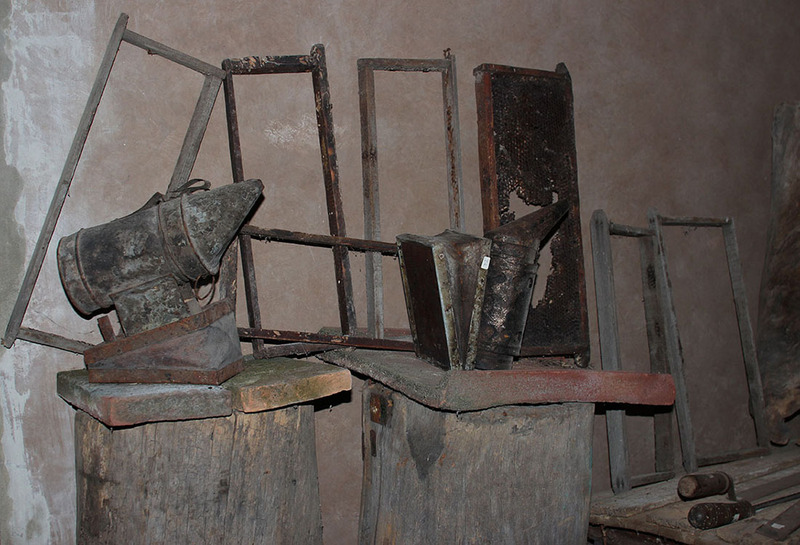 In the olive mill, the sharecroppers and the “priest’s” peasants, those who worked the lands owned by the Church, brought and crushed the olives harvested on their own farms. 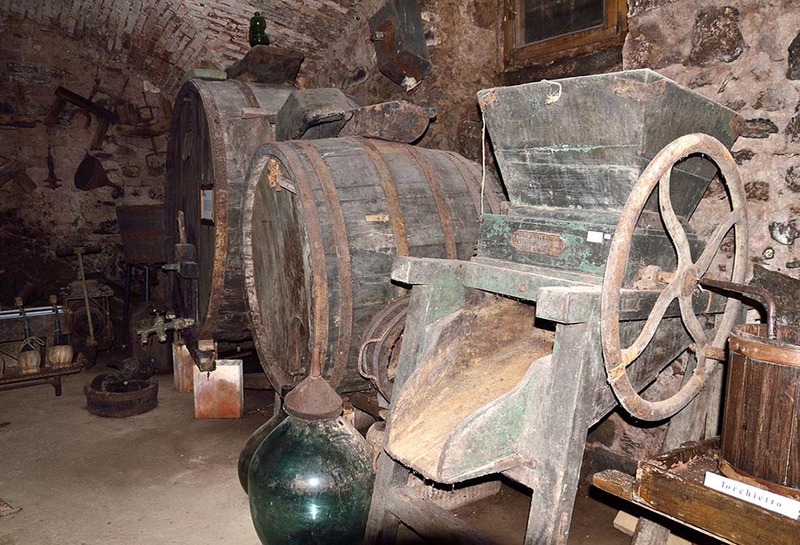 Making olive oil was a lengthy undertaking and included several phases: the olives were crushed and pressed in the large stone mill. 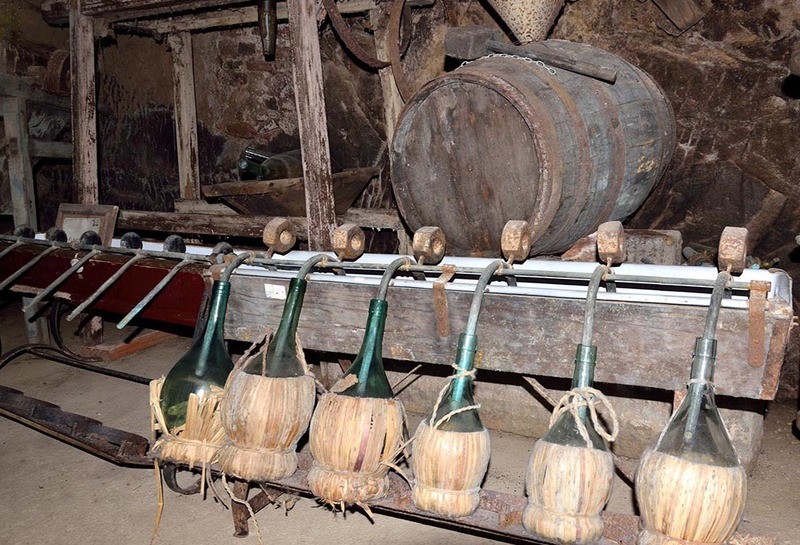 The paste obtained was then placed on stiancini and pressed in the press: the resulting liquid fell into the basin below, equipped with a tube that allowed for the separation of the oil from the water. 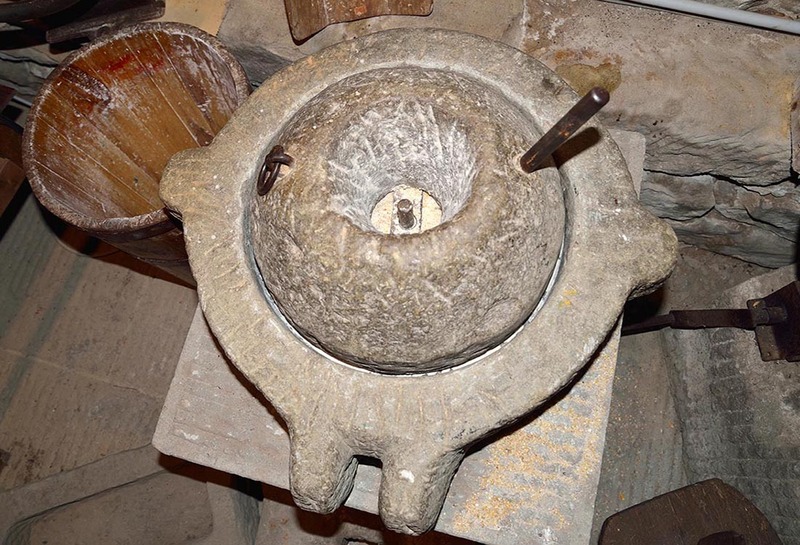 The water, a part of the oil and the residue were collected in the infernaccio or Hellish place, providing the so-called “Olio d’inferno” or “Oil of hell”, while the pure oil obtained was poured into large earthenware bowls and decanters, and through a series of transfers, was adjusted to obtain the final product, with its typical greenish colour, which was then poured into the storage urn. 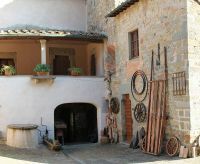 When the work was finished, all tools used for the transfer of the oil were then left to drain in a container made of terracotta with a beaked mouth, the Guadagnolo: all the oil collected with this system was traditionally kept by the miller, and it was considered extra payment for his work. 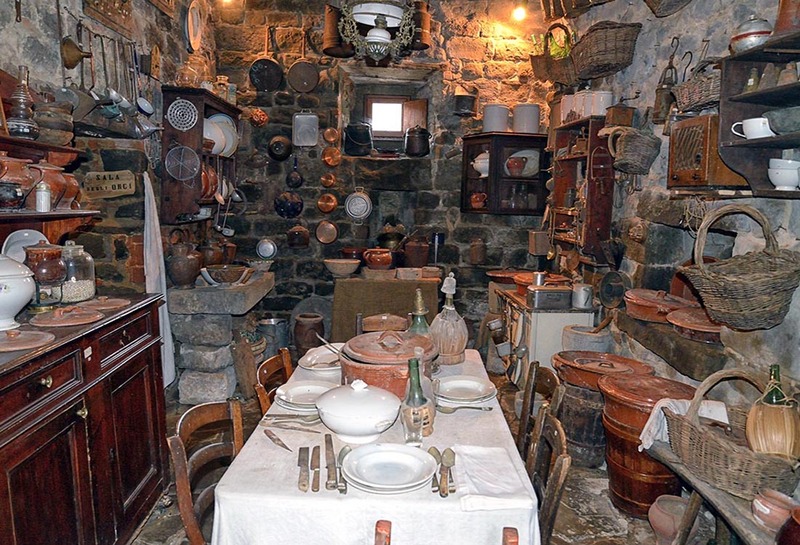 La cucina era il fulcro della casa, attorno al quale ruotava la vita quotidiana; era la stanza più vissuta e la più riscaldata, vi si mangiava, si produceva, ci si riposava ed i vecchi, accanto al focolare, raccontavano storie d’altri tempi. 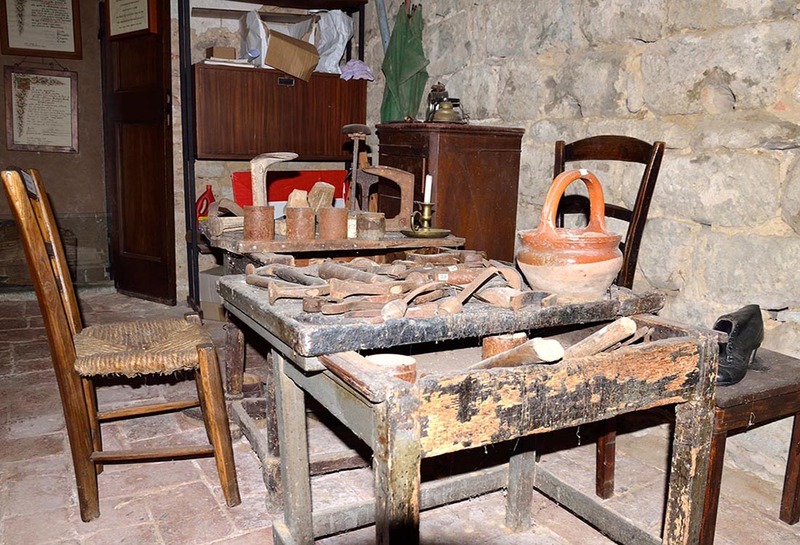 Questo era il regno incontrastato della donna: nella gerarchia dei ruoli femminili, proprio nella cucina si stabiliva che la più anziana della famiglia, spesso la suocera, realizzasse il controllo e l’organizzazione del lavoro domestico al di fuori delle necessità agricole, sulla base soltanto delle esigenze di funzionalità e di decoro dell’ambiente domestico. 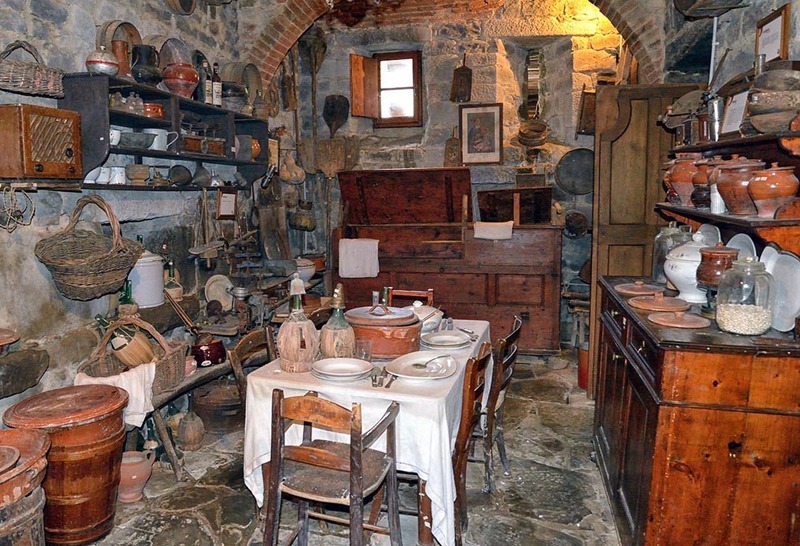 La cucina si trovava generalmente al piano terra ed era di dimensioni abbastanza grandi, poiché qui la famiglia del mezzadro trascorreva la maggior parte del tempo soprattutto in inverno. 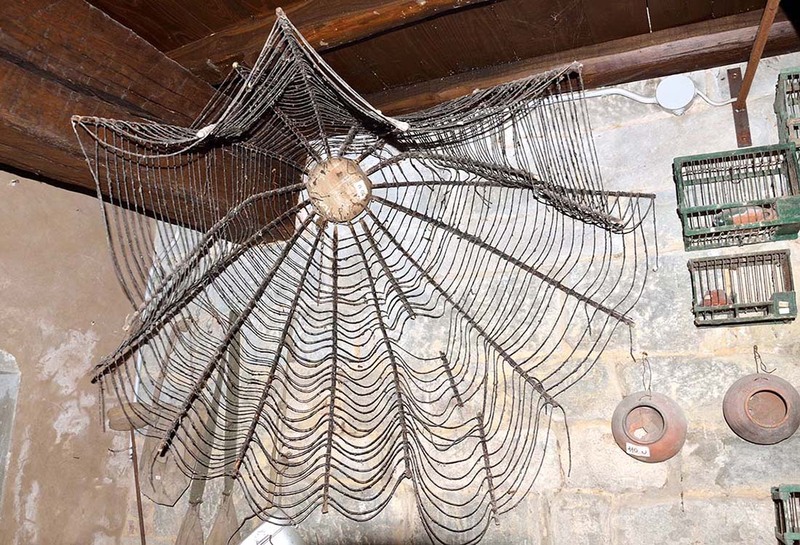 due o più fornelli, con vari treppiedi. La zona intorno al camino era chiamata “il canto del fuoco”, luogo dove venivano svolti piccoli lavori agricoli, come la pulitura dei salci, e la creazione di cestini per damigiane e molto altro. Nei giorni più freddi vi si radunavano per scaldarsi i vecchi ed i più piccoli e gli adulti si confrontavano sulle difficoltà quotidiane. Wheat was essential to the rural civilization, a raw material for food but also a source of income. 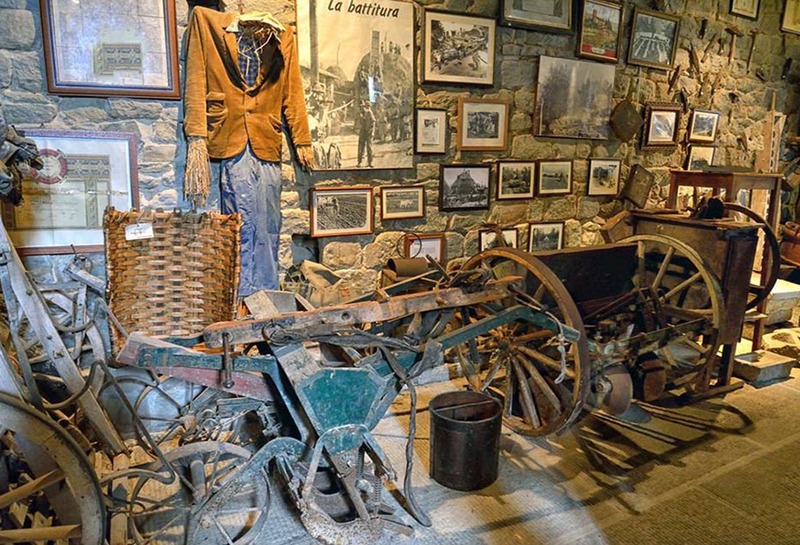 Before the advent of farm machinery, the wheat cultivation phases were carried outentirely by the farmers of the estate. Broadcast seeding was used to plant from 1 to 1.5 bushels of wheat (1 bushel = 20 kg) per staiolo (2000 m). Then it was passed over by the cultivator or sbornia, a tool consisting of curved teeth that bury the seed. Once it had ripened in summer, the wheat was harvested with sickles, tied into small bundles (manne) and stacked in the fields to be transported to the farm with the help of the wagons. The harvest was a real event for the peasant society: people rose before dawn to harvest the ripe wheat fields and prepare for the next phase of threshing, which took place in the farmyard of the estate and served to separate the wheat grain itself from the less noble parts of the plant. 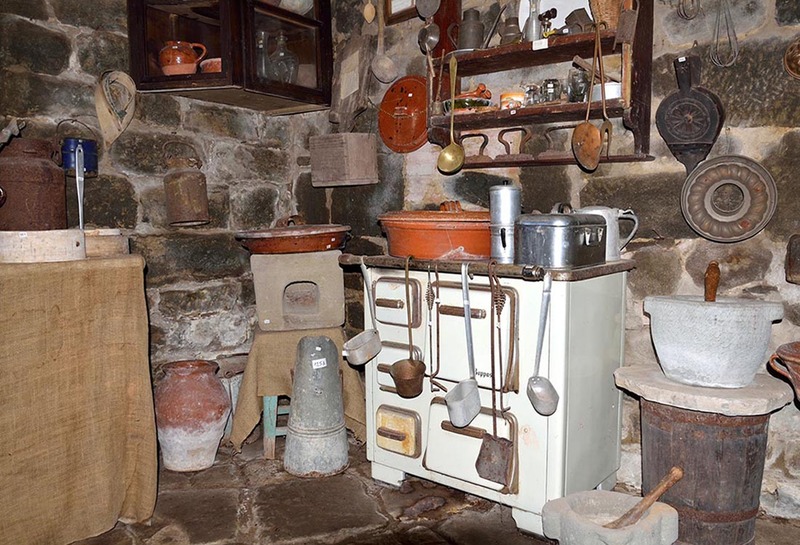 For threshing in the farmyard, great festivities were held and large tables set up where all the workers gathered around a banquet which included a rich soup made with duck or goose and other rural dishes. 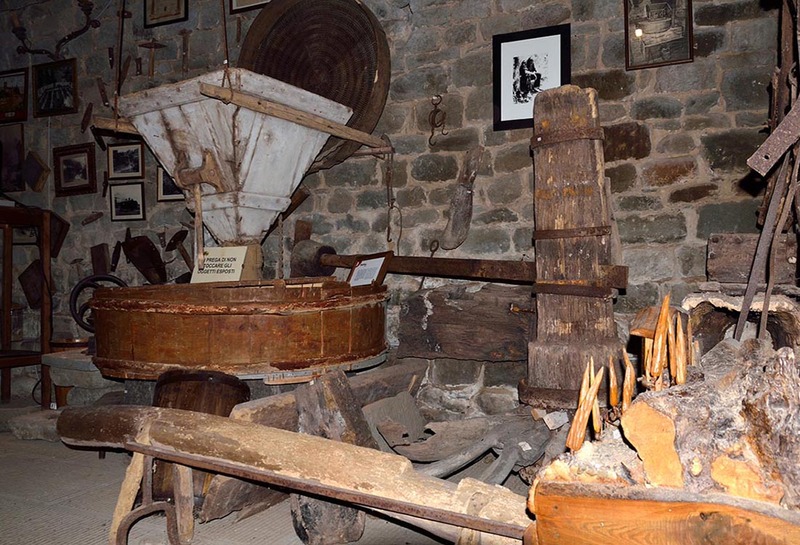 The wheat, after having been further sifted and measured using the “bushel” to determine the amount allocated to the owner of the land and the amount to the peasants, was kept in the barn until it was taken to the mill and processed into flour. 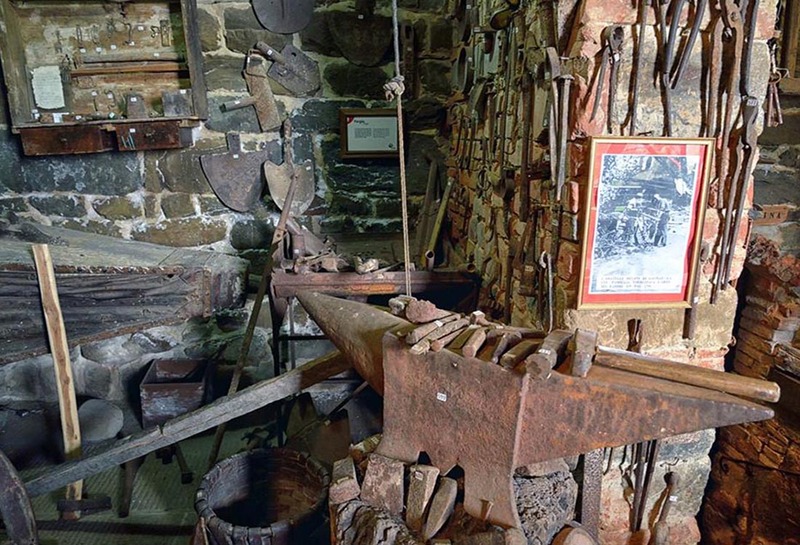 These workshops gathered the tools of two professional artisans who were fundamental to the rural life: the blacksmith and the carpenter, often found in the single figure of the blacksmith-wagon maker who combined the qualities and capabilities of both. 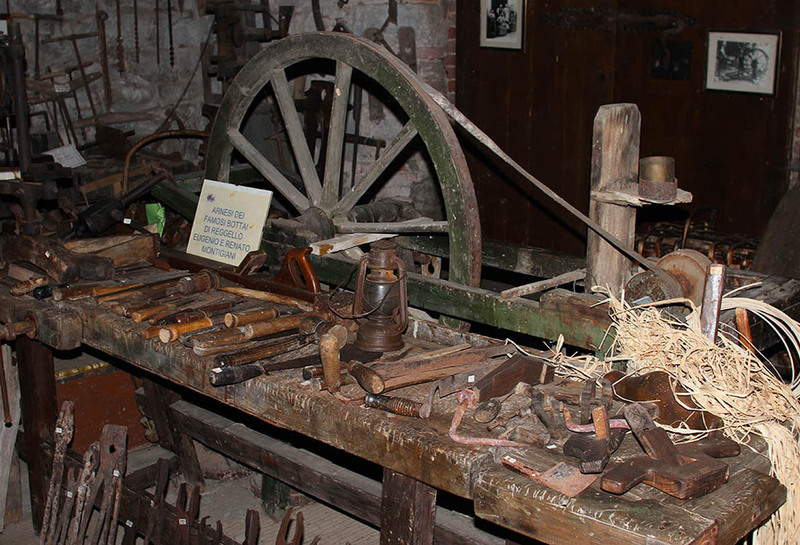 The lathe, the sgubbie and chisels were his stock in trade, with which he not only built furniture and furnishings for the homes of farmers, but most items needed for daily work: barrels, wagons and many other pieces of equipment and tools. In rural villages the shops of the blacksmith and the carpenter were the meeting place of farmers who, in the rare moments of rest, went to these shops to have these artisans repair work tools or simply to meet up with other people. It could also happen that one saw the farmer there for repairs to the large wooden wagon wheels or the hoops on the barrels and kegs. The farmers paid the artisans in kind, with wheat, wine, oil, beans and chickens. 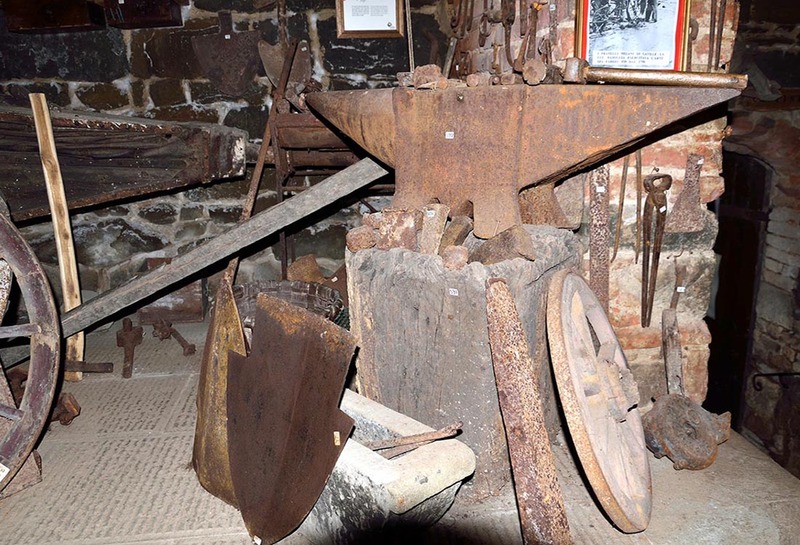 The smithy was usually a narrow little place, sometimes attached to a hou The carpenter however, worked in a large room with the bench in the centre and the tools hanging on the wall in special racks. 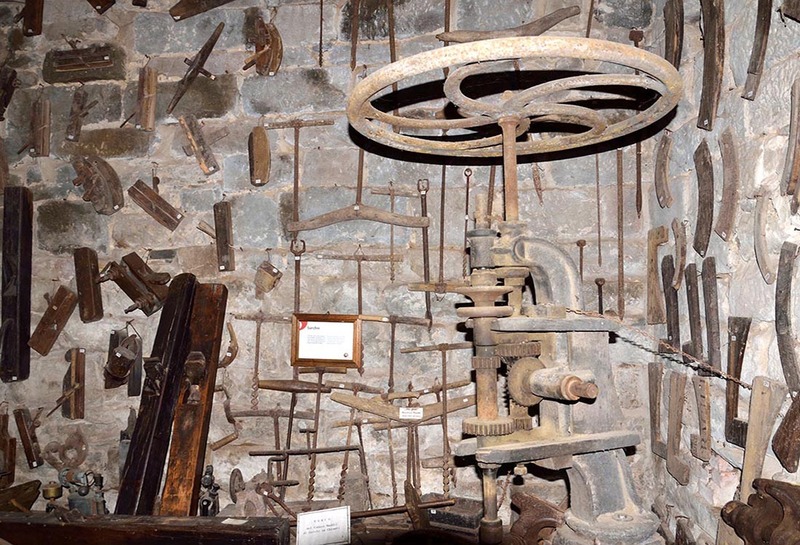 Saws and other tools of a larger size were usually placed on some boards under the counter, while a lathe or a tripod might be kept in a corner. 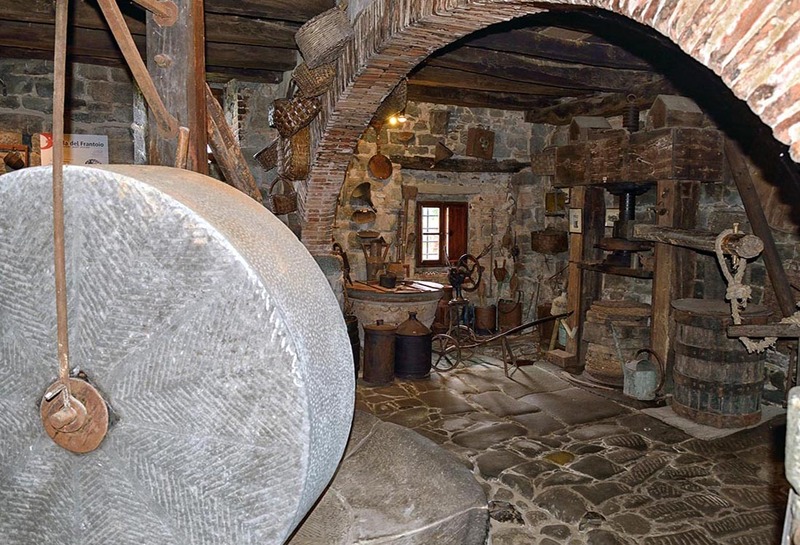 The winery was located in the wing of the house that was cooler and less exposed to sunlight, either on the ground floor or the floor below ground level. 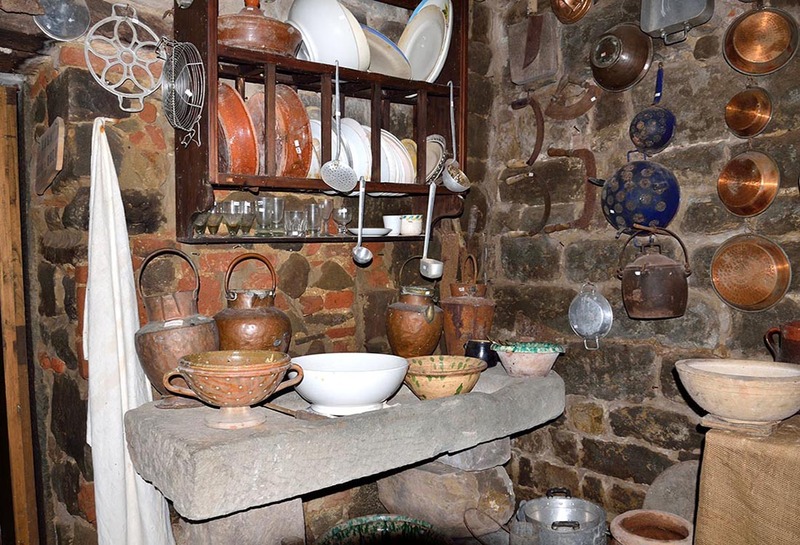 Here the food and beverages that could be conserved for long periods were kept, and it was crammed with vats, the wine-making vats, demijohns, barrels for wine and sometimes the oil jars. 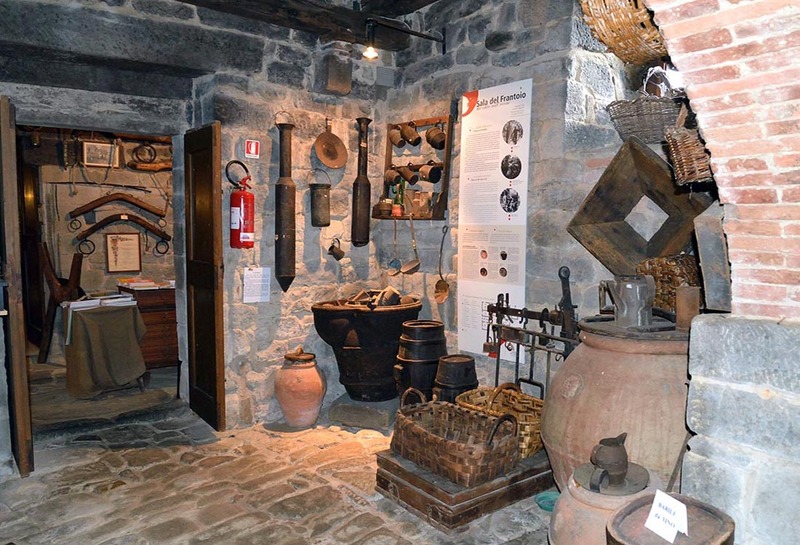 The first step in the grape’s progress from the rows of vines to the glass began in the bigoni or bigonci, wooden containers used near the vineyard rows for picking the grapes during the harvest. 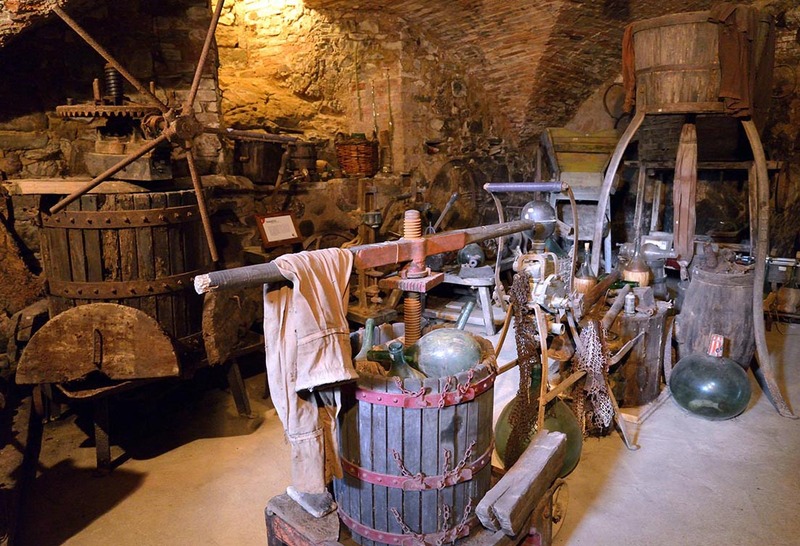 From there they went to the cellar, where the grapes were fermented in vats and the marc taken in bigoni to the winepress, where they were pressed again with special equipment, producing more wine. 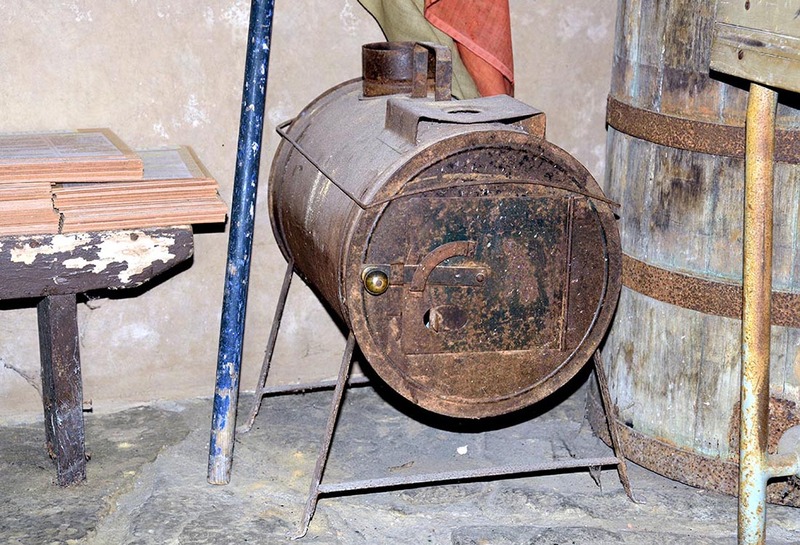 To disinfect the barrels and demijohns, sulphur was burned and dissolved in a small pot. Strips of cloth were dipped into it, soaked in this liquid disinfectant and then placed in barrels previously washed with water. 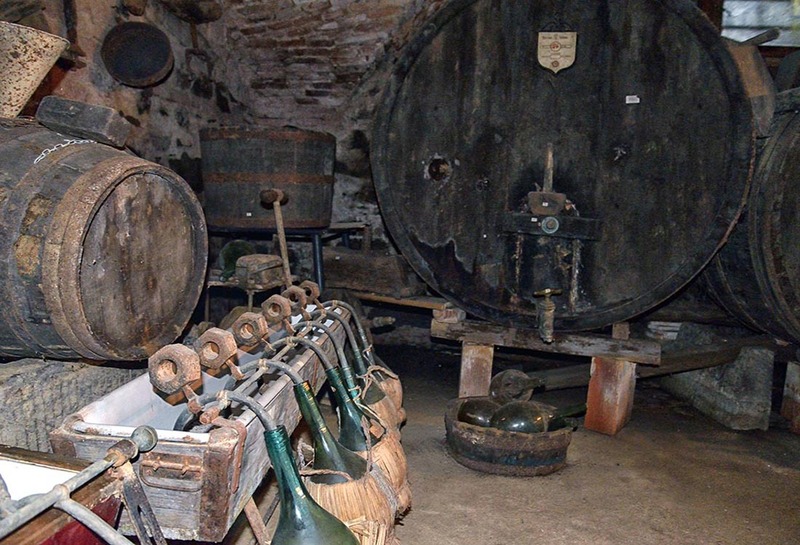 After the harvest, the wine was then racked from the vats into barrels, which had been washed and disinfected, and left to age; for the entire settling period the barrel was sealed and the cap “bricked”, to prevent the internal pressure from blowing it up. 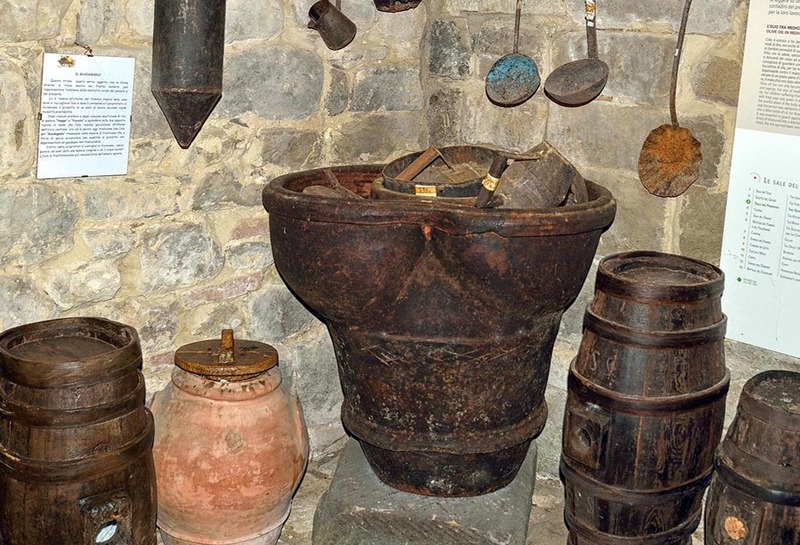 After a few months, when the moon was in a propitious position, the wine was racked into demijohns to allow for the removal of residue and then poured into the characteristic straw-covered flasks, and kept in the cellar at the disposal of the whole family. 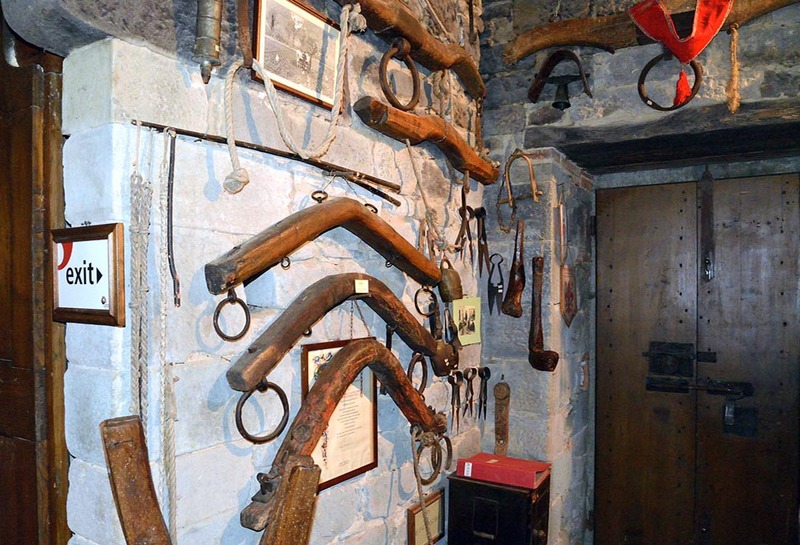 This room was often called the “Devils’ Room” by the peasants, a picturesque expression for the storage room of the house, where all sorts of objects and utilities were kept. 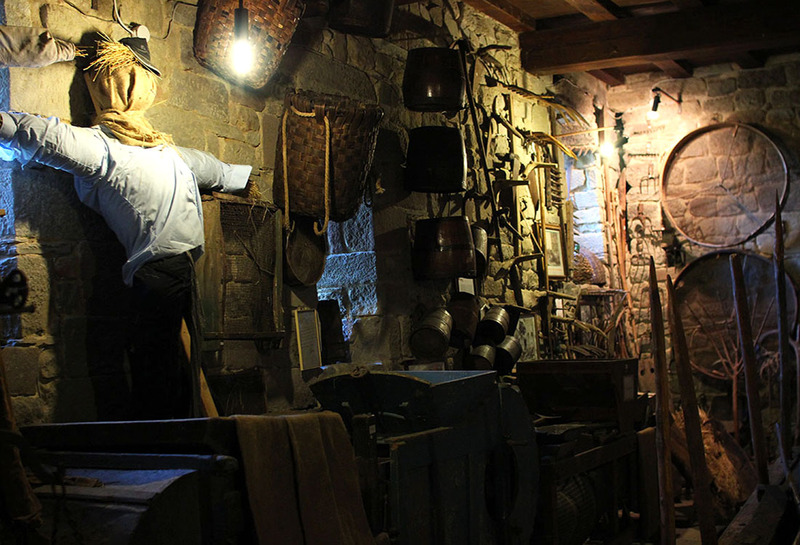 Here all kinds of manufacturing and repair also went on, when the weather and the season kept people indoors. In times of economic hardship, the peasant family tried to take what they could from the earth and countryside for everything they needed, so when wool was too scarce or expensive, the mattresses were filled with corn husks or other “plant” leaves. The corn husks, after being collected, were dried in the sun and used to fill the “big bags”, the ancestors of mattresses made with thick hemp cloth woven on the loom. 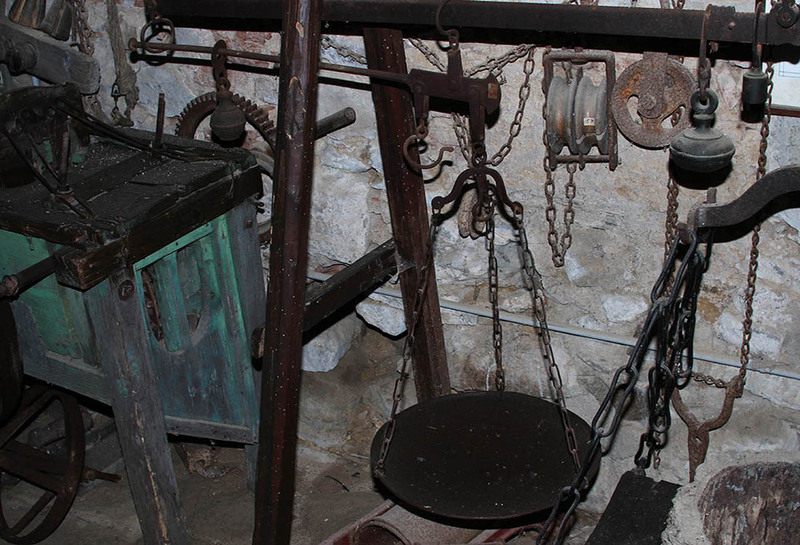 The mattress was then laid on the bed, which in rural homes had no spring, but was composed of two headboards held together by iron bars on the side and on which rested wooden planks to form a base for the bag. To make the bed more comfortable, in more modern times another bag filled with chicken feathers was laid over the sack of corn husks. 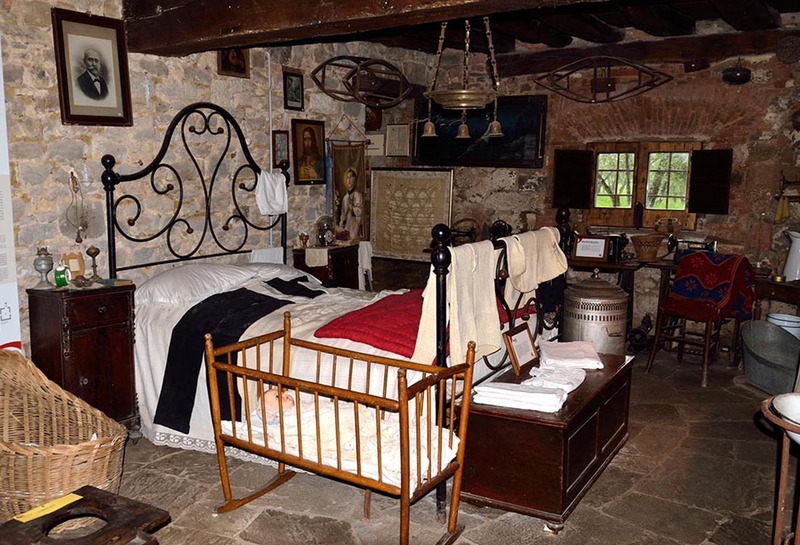 The more elaborate mattresses were filled half with “vegetable” material and the other half with wool, in order to have one side for summer and one for the winter. La caccia era una risorsa alimentare straordinaria per la famiglia contadina, che integrava con la selvaggina la scarsità di carne presente sulle proprie tavole. 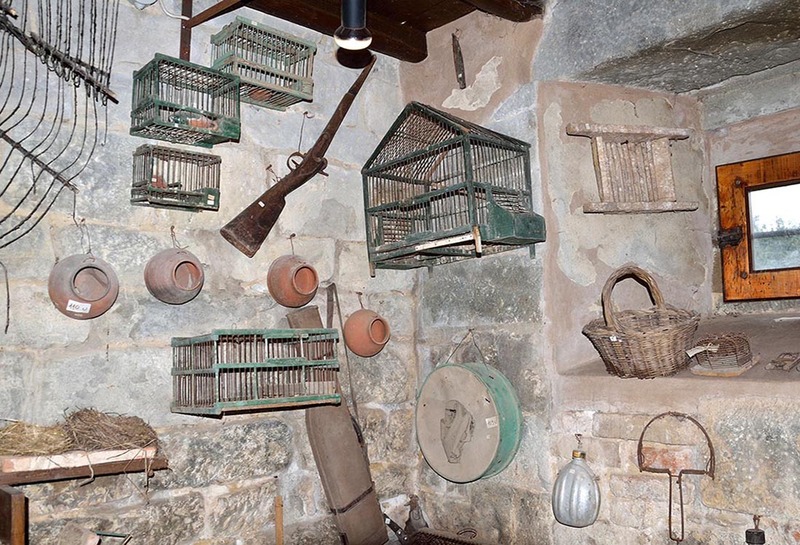 Trappole di ogni sorta, diverse in base alla preda da catturare, armi da fuoco ed accorgimenti strategici, quali l’uso della pania per la caccia agli uccelli, erano gli strumenti del mestiere. Spesso quest’attività più che per scopi alimentari, era praticata per la cattura di animali da pelliccia, da vendere poi nei mercati per ricavarne moneta contante, che sempre scarseggiava in una economia basata sul capitale fondiario e sull’autoconsumo. Il miele era invece un alimento molto presente nelle case contadine, efficace ricostituente per i piccoli, dolcificante di uso comune ed ingrediente indispensabile nella vita domestica per i suoi molteplici usi, non solo alimentari. La smielatura aveva luogo all’inizio dell’estate e nell’avvicinarsi dell’autunno, nello specifico si procedeva ad estrarre tramite forza centrigufa il miele dai telaini estratti dalle arnie. 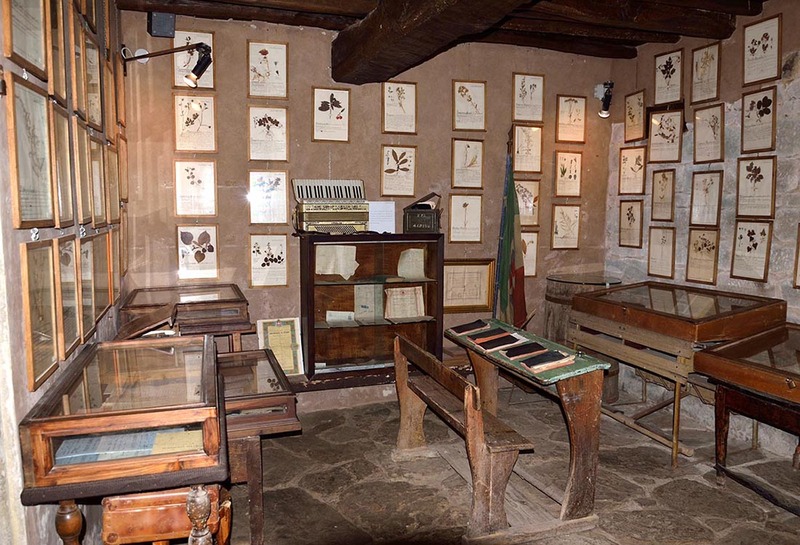 Le arnie rustiche erano ricavate da una parte di tronco d’albero cavo tagliata, la cui denominazione cambiava in base all’area di provenienza: dal bigonzo dell’area di Firenze alla hàssa dell’aretino. In queste arnie venivano poi collocati bastoncini di legno incrociati in varie altezze, in modo da creare punti di appoggio per la costruzione dei favi. Al contrario di quel che avveniva con le arnie rustiche, in quelle moderne il miele può essere invece raccolto con estrema semplicità, estraendo i telaini pieni e mettendone al loro posto altri vuoti. 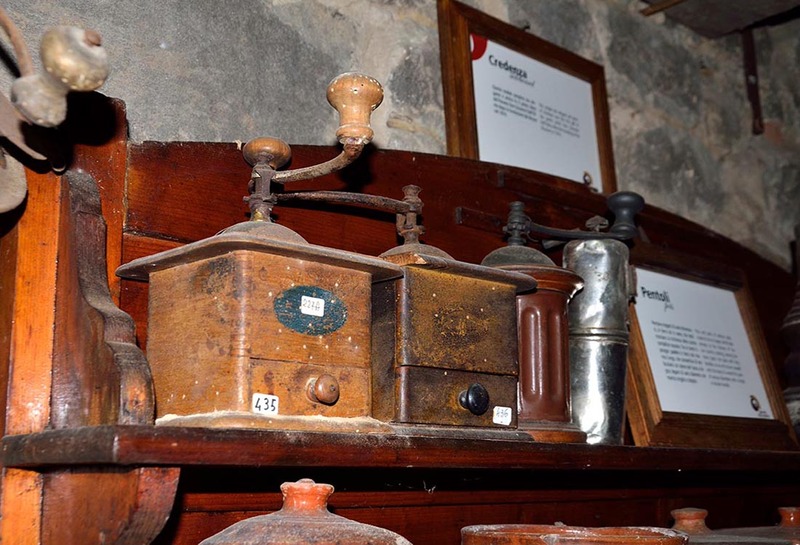 In addition to “industrial” exploitation, already in the early twentieth century, the use of herbs for medicinal purposes has its roots in the dawn of rural civilization, where “witches” and “healers” often prescribed tisanes and mysterious potions for men and animals. 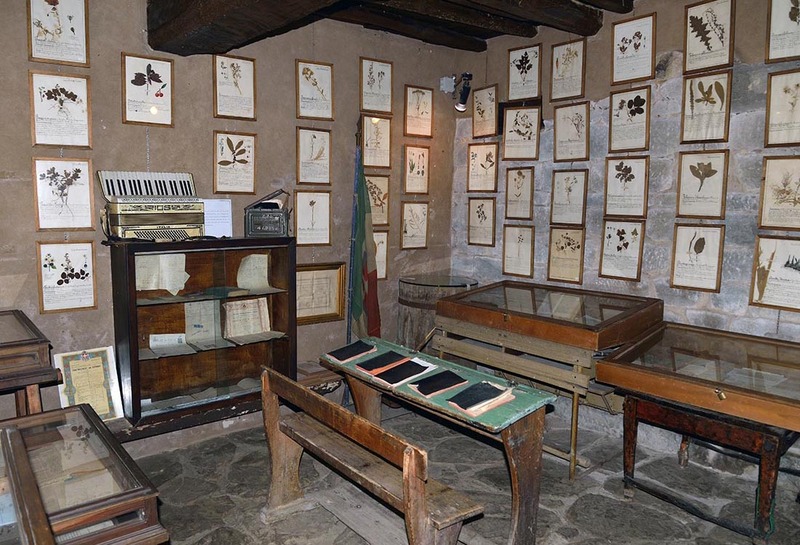 Beyond the abuse, there was an oral tradition in the farming families of knowledge handed down from father to son on the therapeutic properties of herbs commonly found in the woods and farms of the area. Among the plants most used were, for example, chamomile, known for its anti-inflammatory properties, the fern, which today is used for decorative purposes, and nettles. 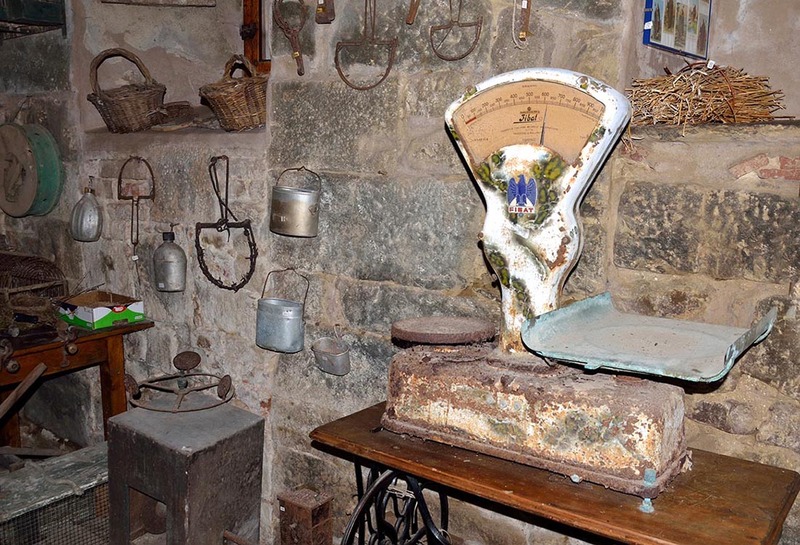 Alongside these we recall the so-called “aromatic herbs” of the kitchen such as garlic, rosemary and fennel. There are plants whose therapeutic properties today are almost completely unknown, such as the poppy, gramigna or couch grass and mint. To these we can add pine and oak, olive, walnut and chestnut, important for both nourishment and health in rural society. In the wealthy towns, shoemakers often put their mastery at the service of the local lords, satisfying all the customer’s desires. This way they could really show off their skills, crafting different types of footwear based on who would wear it, how it would be used, and last but not least, the current fashion. 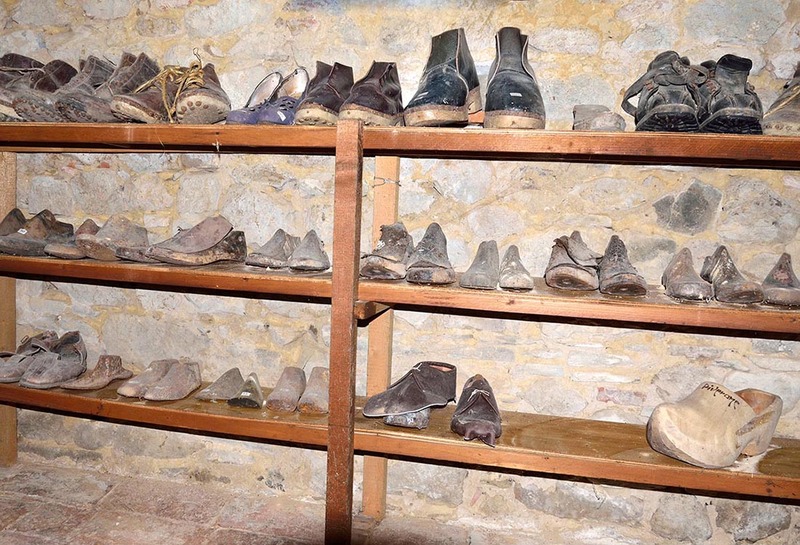 In farming or pastoral areas, the situation was different: the “peasants”, in general, could not afford custom-made shoes and the cobbler was accordingly limited to repairing or making use of the old worn wooden clogs and shoes, often using recovered materials. 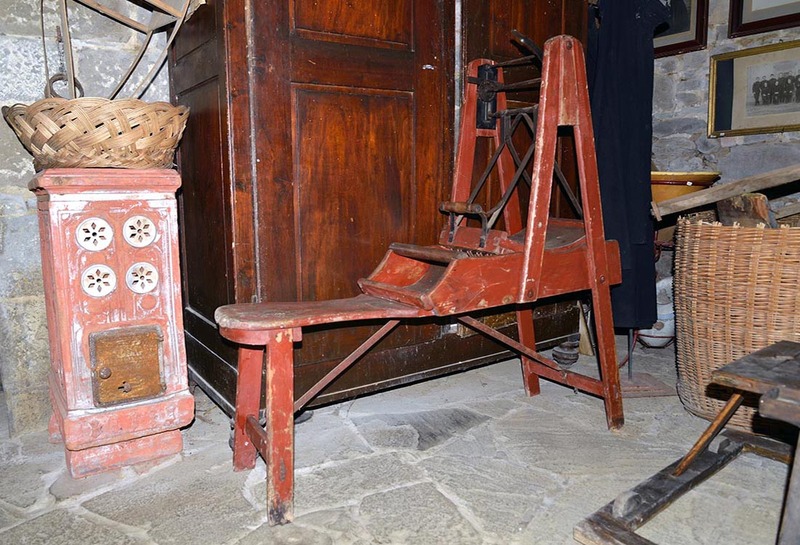 To make the clogs last longer, the shoemaker usually applied studs to the heel and toe. 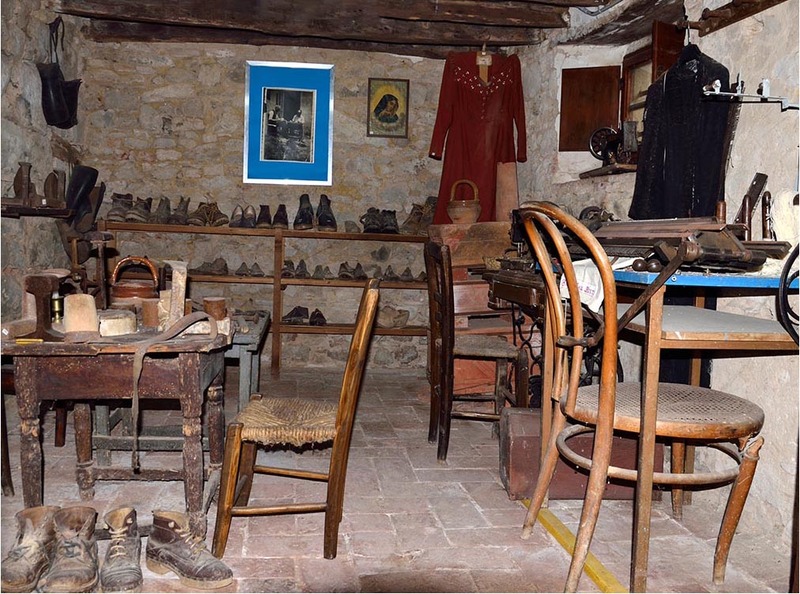 For the manufacture of shoes, wooden forms were used instead, made with a band saw and finished with file and chisel, on which he sewed the uppers using recycled leather, or leather of little value, and applied the simple sole with nails, obtaining the insoles from used felt hats.